Mon, Mar 19, 2018, 08:27 pm SL Time, ColomboPage News Desk, Sri Lanka. 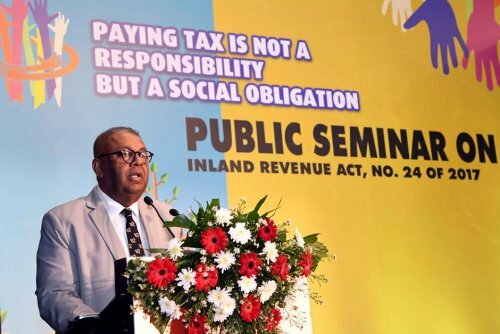 Mar 19, Colombo: Sri Lanka's new tax system, which will be effective from 1st of April would create a level playing field for everyone to do business promoting the business climate, Finance Minister Mangala Samaraweera said. A public awareness seminar on the new Inland Revenue Act that will be operational from 1st April 2018 was conducted today under the patronage of the Finance Minister. Today's seminar is one of many such programs to be organized island wide on the new Revenue Act with the purpose of reaching to the general public. Addressing the seminar, Minister Samaraweera emphasized that the new Inland Revenue Act, which received two thirds majority approval in parliament, is a widely endorsed piece of legislation that needs methodical implementation. "My contention is that our work will bring a paradigm shift to taxation in this country that in line with our policy of updating complex legislations to achieve our development goals in this 21st Century," the Minister said. Minister Samaraweera explained that Sri Lanka's current phase of international economic standing as a middle-income country does not allure significant amount of foreign aid and grants. In addition to that, in a precarious international investment and trade environment, developing countries like Sri Lanka must enhance the fiscal income with a view to offset the narrowing external drains. "We must optimize utilizing our local resources with a well-managed and efficient tax system as a pro-growth catalyst," he emphasized. "We all must, as citizens, become partners, stakeholders and masters of our own development endeavors and this new IR Act was designed to broad-base the tax payer understructure and to encourage all of you to shoulder that collective responsibility," the Minister said. For over two decades, Sri Lanka recorded a downward tax revenue that reached just over 10% in 2014 as a share of the GDP and Sri Lanka was among the lowest tax revenue countries. Despite the continued rise in income levels, the tax revenue failed to record any improvements, he pointed out. Some experts opined that on one hand our tax system was complex and confusing, on the other hand there were numerous ad-hoc tax concessions, over 200 of them, which were granted without any rationale, according to the whims and fancies of the finance minister of the day, Minister Samaraweera added. The elimination of tax exemptions through this new Act would create a level playing field for everyone to do business, moving away from the culture of preferential treatments. This new legislation carves a clear strategic direction about taxation in the country, according to the Minister. "Along with that broader strategic direction, we are setting the platform and working continuously on promoting the business climate by enhancing taxpayers' protections and providing greater certainty on tax affairs," he said. "Also, we are aiming at improving tax compliance by strengthening administrative powers of the Inland Revenue Department to supplement the technological advancements that are being implemented," the Minister added. Recalling that his pledge for the country in 2018 Budget was 'Enterprise Sri Lanka', the Minister said the Government has shown steadfast commitment towards making an investor-friendly environment by carrying out necessary improvements in doing-business and providing infrastructure and other facilities. "Every citizen who wishes to be an entrepreneur will have an environment of transparency, fairness and equity in future Sri Lanka once our new rules-based legal system is in operation," he said. Under the new tax system, the government expects to increase the share of direct income tax against indirect taxes. The preferred ratio is 40% to 60% from the current level of 18% to 82%. The Minister said while increasing direct income tax is one of the hallmarks of a fairer tax system it is an enormously challenging goal and the new Inland Revenue Act is a timely step in that direction. "Your tax payments drive country's future. Your money goes into expenditure on education, health, infrastructure, environment protection, law and order, and welfare improvements, among others. As you would appreciate, our Government implements an array of subsidies and transfers for low income groups." He said the government will continue to provide relief in the event of unforeseen events such as natural disasters. "As tax payers, you all responsibly contribute towards a noble objective of bettering and enhancing the welfare of the society. And on a more fundamental basis, we are aiming at lessening imbalances in income and wealth creation in the country as we progress towards an upper-middle income country." The Finance Minister pointed out that there are many areas to improve as Sri Lankan's tax compliance is one of the weakest in the region. The number of individuals and firms registered for paying taxes remains at a surprisingly low level. These numbers are very hard to be corroborated with the realities given the profile of corporate sector in the country and the labor market dynamics, he explained. The Minister noting that since independence, Sri Lanka's income tax share of the total tax revenue has remained flat and hardly crossed a threshold of 20 percent, acknowledged that even raising one percentage point in the direct tax revenue involves hard work and warrants support from many corners and meticulous coordination. Minister Samaraweera expressed hope that a smooth transition and a better system will emerge with the passage of time.